Stephanie and I visited the Fashion Institute of Design and Merchandising museum in Downtown Los Angeles today. They were showing Disney's Alice in Wonderland design exhibition. Several people came in costume as they were holding a competition. It was fun to see how people off the street interpreted the movie's costumes. There were some really great costumes and some not so great. Inside the museum they had a display of student's interpretations of the Alice in Wonderland theme. Unfortunately I wasn't allowed to take photos, but one student made the most wonderful dress for the Queen of Hearts. It was stunning. They also had many costumes from the movie on display. After visiting the museum and having a lovely lunch at Marie Callendars, we were off to visit Mood. I still haven't forgotten that I'm supposed to be on a fabric fast, so I only got one piece of fabric. It's been a long time since I've been to Mood, so I thought I'd treat myself with this piece of cotton/lycra jersey. I thought it'd make a nice t-shirt for the summer. Mood is much more pricey than shopping downtown, but I make myself feel better by telling myself that the fabric is from Italy. One thing you might not know is that Mood Los Angeles has a store dog like the New York store does. He is a little chihuahua named Oscar. Too bad they didn't name him anything cute like Swatch, which is the name of the dog that lives in the New York store. The chihuahua was so tiny my cat could have eaten it for lunch. On another note, yesterday I celebrated my 100th blog friend. I just wanted to thank everyone of you who visit my blog. I'm thrilled that some of you make my Sewing Saga a regular stop during your day. I have lots of exciting things I want to start creating. Sewing for myself will be included, but I want to get more creative in what I sew, so stay tuned! I think I mentioned in a previous post that I will be making seven dresses for my son's play, The Wizard of Oz. The performances are late July so it's time I get started making the dresses. I'm on a world-wide hunt for the trim. If I have to, I'll replace the trim on the dresses I don't have to make so that they all match. My dear friends, if you've seen anything with sequins and in rainbow colors, please let me know. 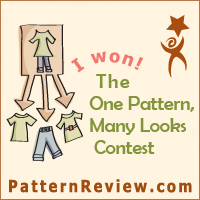 I've found a few leads on patternreview.com, but won't know until next week if they are going to pan out. 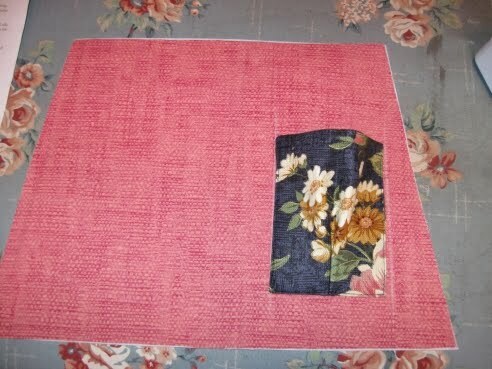 It would work out better if I could find it in yardage so that I can cut it into any shape. I'm willing to purchase large quantities since I need to put it on seven or more dresses and the production group would like to have some stockpiled for future performances since new dresses may need to be made if the current dresses, including the ones I'm making now don't fit the actors for future performances. I also have to make a bathing suit for a friend who asked me at the end of last summer to clone her favorite suit. That won't take me very long I hope. I already have all the materials I need. Another project will be to make a pillow for another friend who gave me the fabric much more than a year ago. You see, I hate home dec and I hate to sew for other people. However since I'm not wanting to sew for myself right now, completing these projects will keep me sewing and get them off my plate and out of my sewing room. I haven't started my summer exercise routine yet. After I clean my house, today is probably going to be the day. My weight loss has been stalled for about a month. I'm back down to the weight I was at when my son was born and at that time I stayed there for over 5 years. I guess set points are real and I'm stuck at one. I really think exercise is what it's going to take to get past it. The diet I'm on requires exercise and my age requires exercise. I guess I better get started exercising, you think? 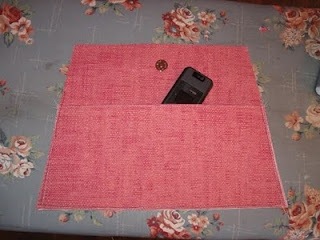 I couldn't let go of the idea that my new purse needed that big floppy pocket divided into a pen and sun glasses pocket. 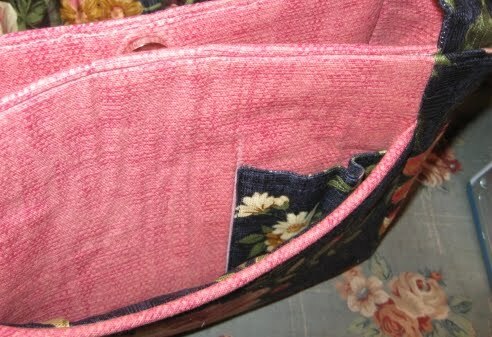 I must have been serious because I had to remove my hand sewn stitches in the lining bottom to open the bag back up. I don't take sewing by hand lightly and avoid it at all cost when I can. Then I had a devil of a time getting the purse back under the pressure foot to sew these lines. I couldn't put it in the machine to sew from front to back so I had to use free motion sewing and sew the lines sideways on my machine. I was very careful about it sewing one stitch at a time and it turned out pretty good if I do say so myself. 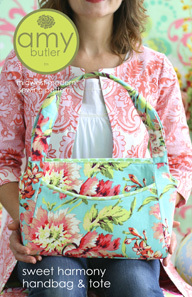 This is the newest Amy Butler handbag pattern called Sweet Harmony. It comes in both the handbag and tote sizes and I decided to make the handbag. I've had the fabric in my stash for only 2 or 3 years and I bought the pattern last December. 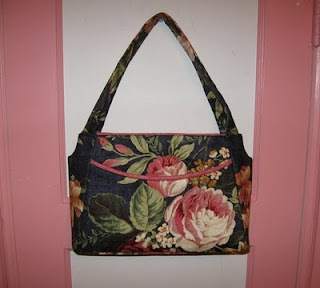 While cleaning out my sewing room yet again, I ran across the fabric and decided that this bag would be my next project. Unfortunately, the pictures do not show just how beautiful this bag is. The fabric has a gold line around the flowers and the print has a jacquard stripe that adds texture to the purse. I only had one yard of each of these two fabrics and the pattern called for 1-3/8 for the body and 1-1/8 for the lining. I had plenty with my 54" home decorator fabrics. In fact, I had enough to fussy cut each piece of the body. 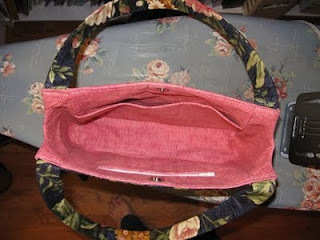 I placed one side pocket so that it would feature one of the roses. Because both sides of the purse are alike I decided to make them different by using the lining for the body behind one of the pockets. That way I could tell which pocket I put things in. I hate searching for things in every pocket until I find it. For the other side of the purse I matched the print on the pocket with the body of the bag. I think it turned out great and matches perfectly. 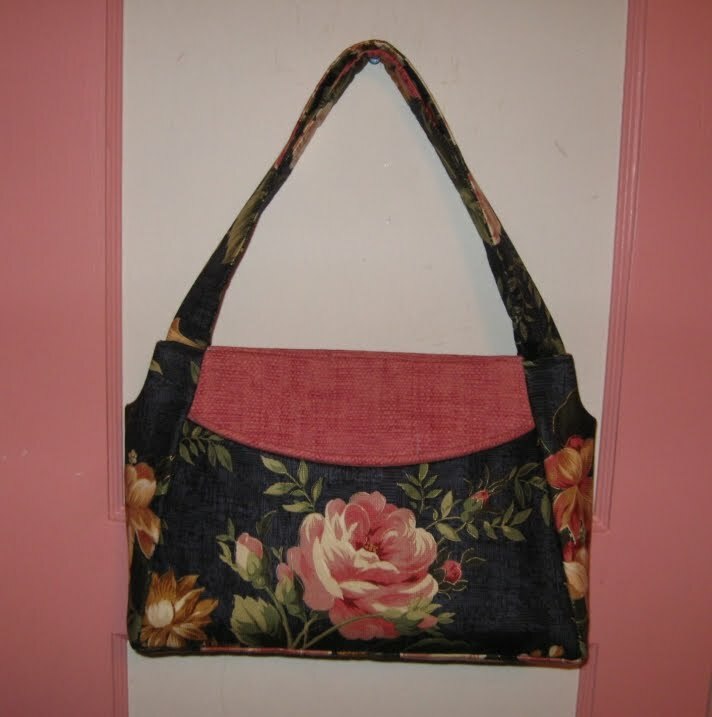 I was tempted to do some free motion quilting around the roses but decided that it wouldn't add much to the look and might even detract from the beautiful print, making it look more quilted wearable art than a designer handbag. I really liked the design and placement of the cell phone pocket. This is the side where I'll keep my keys and the phone. That way I won't have to search for them in every pocket the way I do now. I wish I had added this type of pocket for my sunglasses as well. I'll be sure to make that addition the next time I make it. And there will definitely be a next time. I like purses like some women like shoes. It drives my son crazy because when I tell him to get something from my purse, he can't ever find it since he can't keep up with which one I'm currently carrying. The inside pockets that the pattern called for weren't so great. 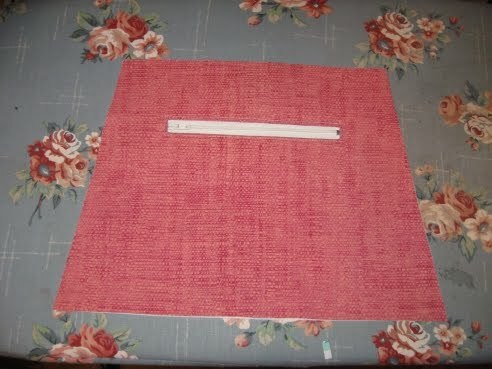 The pattern had you install a zipper on top of a panel which would have been bulky and much too big. I made the pocket and omitted the zipper, which is one option the designer provided. I wish I had sewn a dividing line down the middle of this pocket because it flops open inside the bag. It's just too big and should be divided. I think putting two dividing lines would be nice allowing space between the lines for a couple of pens would have been cool. It's too late to add that now, however. For my zippered pocket, I decided to do my own thing and made a window for the zipper and added a pocket bag behind the zipper. That way my things are inside the lining and out of the way inside the pocket. This is where I keep my lipstick and advil and other small things I don't want to lose on the bottom of the bag. The inside of the bag is roomy and will certainly fit all I need to carry. You can see in this photo that I've changed the handles from the strange one that the designer created. I like the two handles that allow me to fully open the bag instead of the way the original handle is one that is bifurcated near the bag to allow it to open. While this wasn't a quick and easy project, I'm quite satisfied with the way it turned out. I had many issues with the pattern instructions and decided to just stop using them and made the bag the way I thought it should be done. I don't know if Amy Butler is this way with her other patterns, but she is overly wordy which makes for a lot of confusion and head scratching. I was getting very frustrated until I stopped reading them and just sewed it my own way. The pattern, however, makes one terrific handbag.